Airmen from the 355th Equipment Maintenance Squadron’s munitions flight build up and break down aerial bombs during the Bushwhacker 18-02 Cactus Flag exercise at Davis-Monthan Air Force Base, Ariz., Feb. 12, 2018. The munitions flight, better known as AMMO, is responsible for building up and breaking down live bombs which are essential to maintaining a lethal Air Force. It’s day six of a base-wide readiness exercise. Airmen are dressed in an intricate but lightweight suit, consisting of a protective gas mask, gloves and over boots, specifically made to prevent deadly agents from reaching the skin and respiratory system. They walk cautiously across a large, concrete platform to the assembly conveyer pad. To the left of the pad, a team of Airmen are already building up laser-guided aerial bombs. To the right, they’re breaking down 500-pound joint direct attack munitions. These Airmen are literally surrounded by tons of explosives, and building more of them while donned head-to-toe in comfortless protective gear. The 355th Equipment Maintenance Squadron’s munitions flight at Davis-Monthan AFB, Ariz., better known as AMMO, has been charged with the responsibility of building up and breaking down live bombs which are essential to maintaining a lethal Air Force. 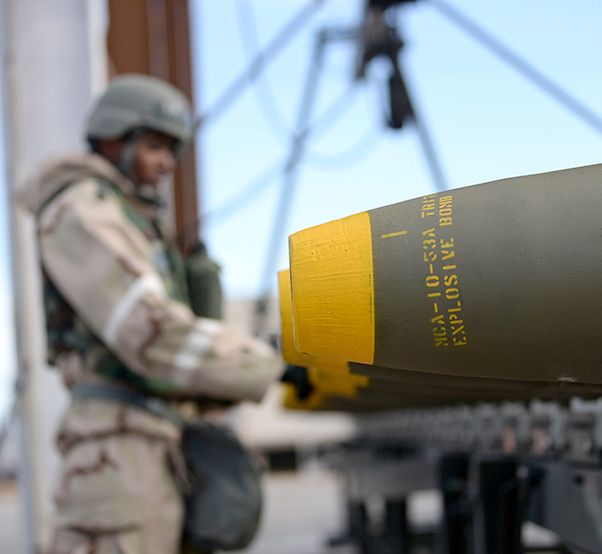 The AMMO flight has continued to be put to the test since the beginning of the Cactus Flag 18-02 exercise, a large-scale training operation focused on ensuring the installation’s ability to effectively generate attack aircraft. But attack aircraft can’t attack without bombs. Airman from the 355th Equipment Maintenance Squadron’s munitons flight inspects aerial bombs during the Bushwhacker 18-02 Cactus Flag exercise at Davis-Monthan Air Force Base, Ariz., Feb. 12, 2018. 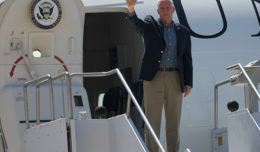 The Cactus Flag exercise was held to test readiness and simulate a deployment. Sustaining Davis-Monthan AFB’s ability to destroy the opposition is no small task, especially during consecutive 12 hour shifts, while wearing mission-oriented protective posture gear. Because the Airmen at the AMMO flight have been working at a grueling pace for a week straight, supervisors had to adapt and implement motivational strategies to make sure their team is performing consistently. Airmen from the 355th Equipment Maintenance Squadron’s munitions flight configure a bomb during the Bushwhacker 18-02 Cactus Flag exercise at Davis-Monthan Air Force Base, Ariz., Feb. 12, 2018. 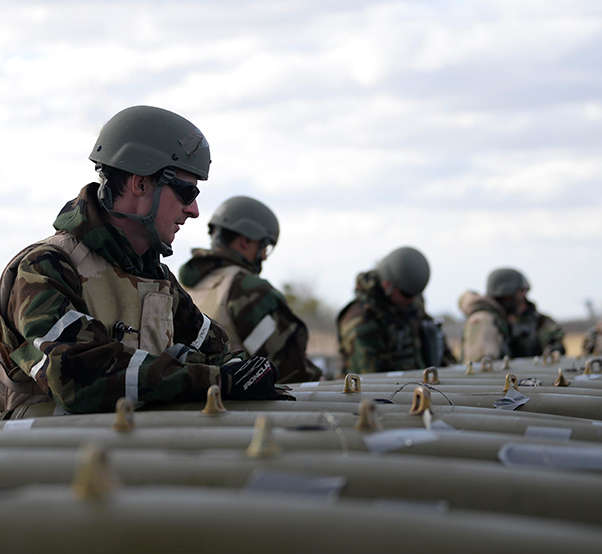 The munitions flight, better known as AMMO, is responsible for building up and breaking down live bombs which are essential to maintaining a lethal Air Force. The AMMO team has a momentous role in the exercise operations. 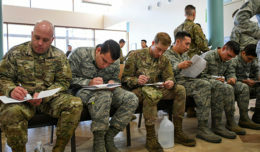 They must maintain a stellar performance throughout the exercise because it is a reflection of how they’re expected to perform in real world operations. But of course, there is always room for improvement. 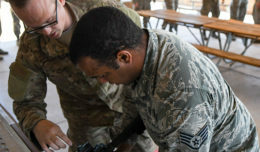 With the challenge of enduring a week of around-the-clock operations, Airmen from the 355th EMS continue to provide excellent service and maintain mission readiness not only during the Cactus Flag exercise, but for any fight anywhere any time. 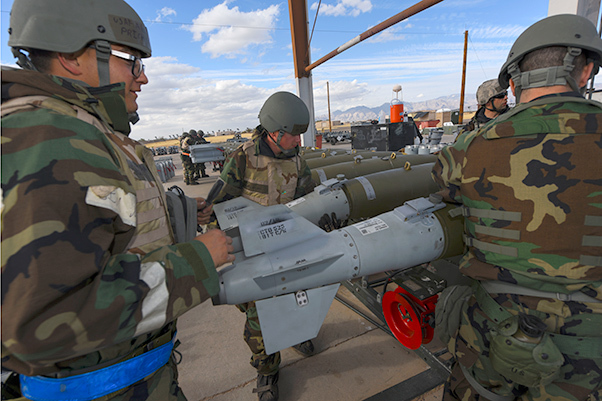 Airmen from the 355th Equipment Maintenance Squadron’s munitions flight work together to break down joint direct attack munitions during the Bushwhacker 18-02 Cactus Flag exercise at Davis-Monthan Air Force Base, Ariz., Feb. 12, 2018. The Cactus Flag exercise was held to test readiness and simulate a deployment.